Retinal vein occlusions are types of retinal vascular occlusions (RVO). There are two types of vein occlusions. Branch retinal vein occlusions (BRVO) and Central retinal vein occlusions (CRVO) affect retinal veins and differ by the amount of retina involved. For instance, “branch” retinal veins usually affect 50% or less of the entire retina, whereas central occlusions affect the entire retina. 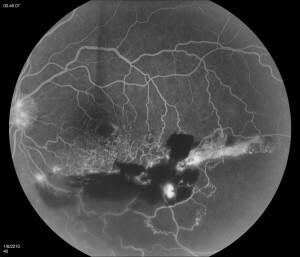 Retinal vein occlusions are thought to occur as a result of hardening of the arteries. The harder arteries can compress the softer veins where the two cross. Acute and painless loss of vision are the most common symptoms of both types of occlusions. A CRVO usually involves diffuse loss of vision whereas a BRVO may affect about 50% of the vision as less retinal tissue is involved. Branch retinal vein occlusions often involve central vision, but not always. Patients with a central occlusion typically have central vision loss extending to include the peripheral vision. The best way to diagnose a vein occlusion is to dilate your pupils to allow your eye doctor or retina specialist to examine your retina. Vein occlusions have a typical appearance and are usually easy to see and diagnose. Additional diagnostic testing may be required including a fluorescein angiogram and an optical coherence tomography (OCT), both of which are available at our Orange County office on Birch and Bristol. A common finding in both types of occlusions is macular edema or swelling of the macula. The macula, the central part of the retina, gives us central vision. Swelling of the macula can cause significant loss of vision. The goal of treatment is to reduce the macular edema or swelling. There are several ways to achieve this. Laser treatment, especially in cases of BRVO, used to be the only way to reduce macular edema. The treatment can be performed in the office and is usually performed by a retina specialist. Intravitreal injections of anti-VEGF medications such as Avastin, Lucentis and Eylea are additional ways to treat the macular edema. Steroids can also be very effective in treating both branch retinal vein occlusions (BRVO) and central retinal occlusions (CRVO). Ozurdex is a sustained release implant which is FDA approved for the treatment of RVO (retinal vascular occlusions). Retinal vein occlusions interrupt the normal blood flow of the retina. Complications can arise due to the reduction in flow. Abnormal blood vessels can grow inside the eye in response to the vein occlusion. Left unchecked, this can lead to a specific, painful type of glaucoma call neovascular glaucoma. Please leave a comment below if you have a question. If you would like to make an appointment, please call us 949.427.2020.